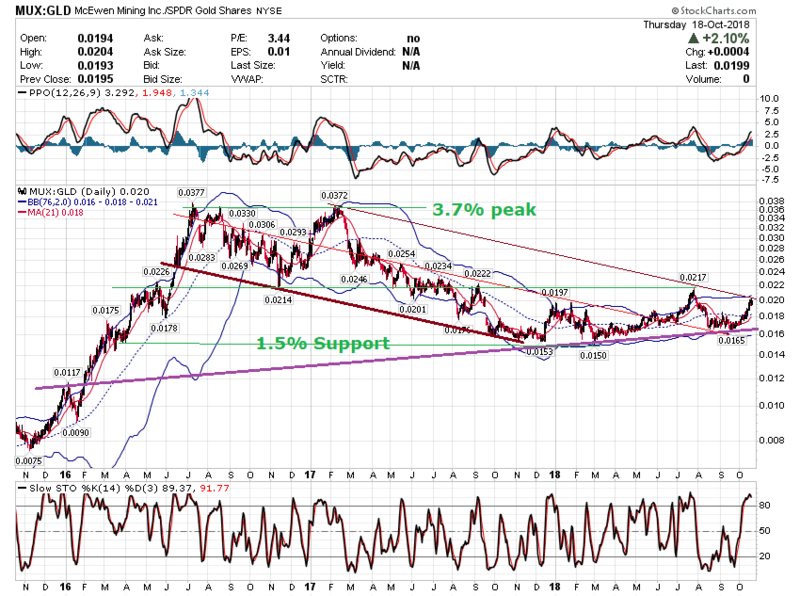 Rob McEwen: "We're In The Beginning Of A Bull Market"
HIGH BETA TO GOLD: 2.7x ! DAILY VOLUME : 3.5M AVG. 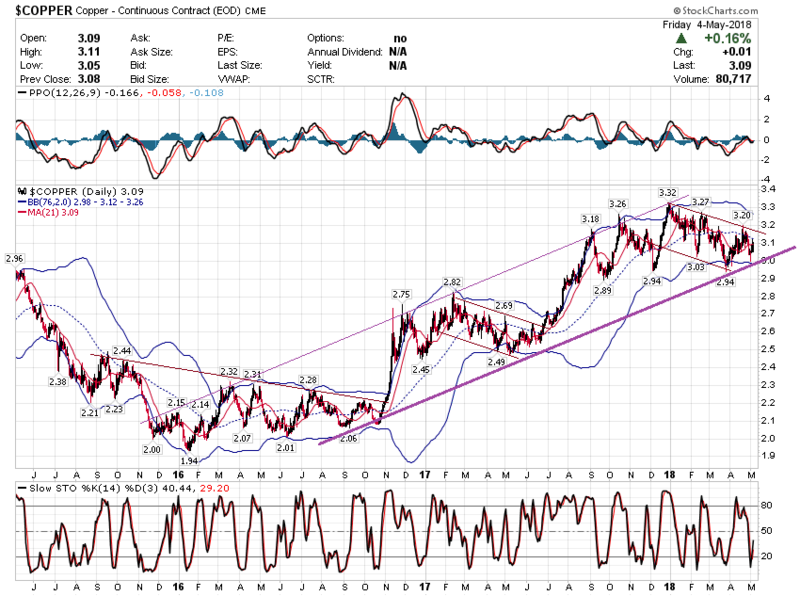 Big Wave of Investment in Gold Shares coming? We learned from Mr. Rob McEwen, Chairman and Chief Owner of McEwen Mining, that the reason the company is looking to qualify for the S&P 500, which represents 80% of the equity capital in the country, is that they expect a big wave of investment in gold in the near term and the great bulk of the buying will go into gold stocks in the S&P 500. 1. 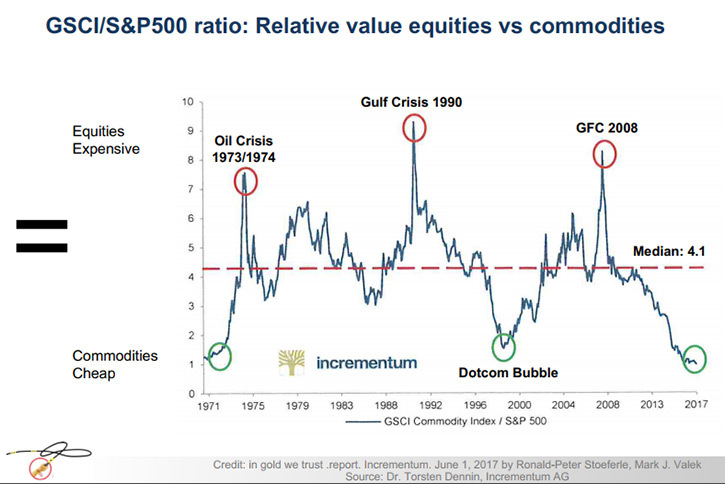 It is critical to understand that only a very small number of gold producers can gain admittance to the S&P 500 index. The first criteria is the company must be American, which McEwen Mining is. That eliminates 99% of all the gold producers worldwide. 2. 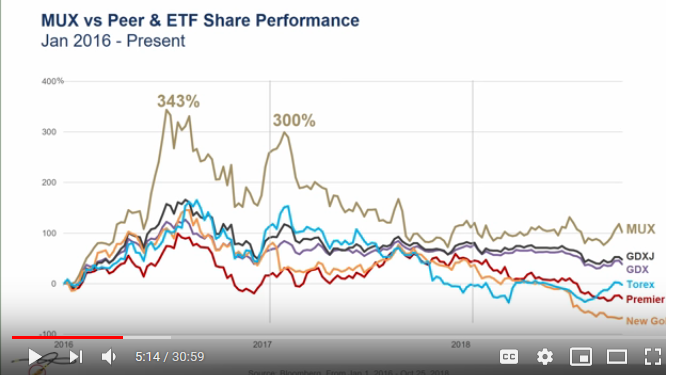 Given the growing presence in the market of passive investment management, index investing and ETFs, the importance of being in the S&P 500, the largest segment dominant index in the market cannot be overlooked. 3. Being in the index provides a competitive advantage. That is the reason for MUX to reach for our goal of being included in the S&P 500. "In October 2017 we purchased another property in Timmins, an operating mine, a short distance away from the assets we purchased earlier in the year. The mine we purchased in October was called the Black Fox Complex, we bought it from Primero Gold, who had bought it in 2014. We think we got a good price. Primero purchased the property in 2014 for $300 million, they assumed $140 million of liabilities, and put $120 million into development and exploration. Primero’s total investment in this asset was $560 million and we purchased it for $35 million. We paid six cents on the dollar." It came, also, with $150 million of tax pools, which will allow us to shelter a large part of our income for many years going forward. It also has an operating mill and tailings area permitted that has excess capacity that will allow us to process ore from the Lexam VG properties that we purchased in the spring of 2017. In Mexico, our El Gallo Mine is an open-pit, heap-leach gold Mine, which is nearing the end of its life, at least as far as mining the oxide ores. We've been building a resource base of sulfide ore. This ore type would require an additional capital investment in order to recover the gold economically. At the same time, 5 miles away from the gold Mine, we have a silver deposit on which we have been reworking the economics. It requires a silver price above $18 before we want to put money into the ground and build a Mine. Mr. Rob McEwen: ... McEwen Mining is debt-free. Our treasury has about $60 million in liquid assets. I own 24% of the company, my cost base is $133 million ($1.64 /sh*) . My salary is $1 a year and I have elected not to receive any bonuses or options. In the last 13 years I was at Goldcorp, our share price compounded on an annual basis in excess of 31% a year for 13 years. 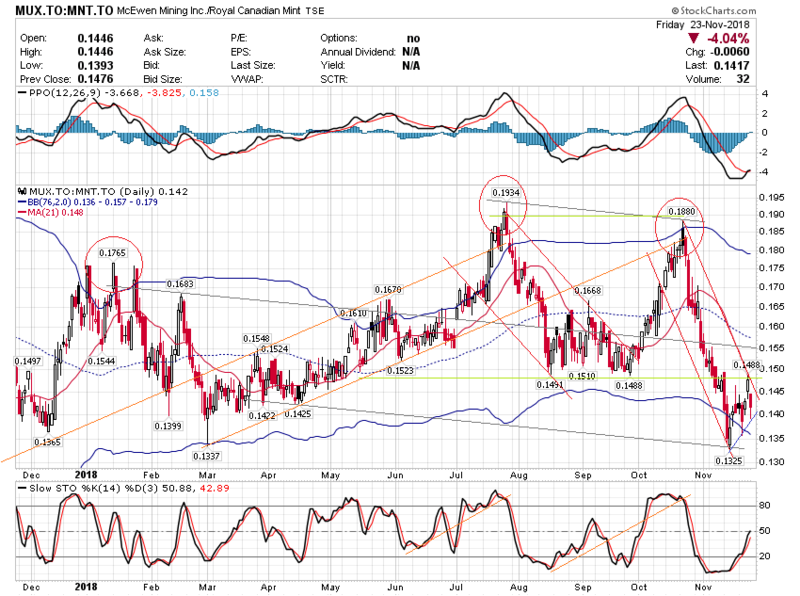 This type of share performance is exactly what I would like to repeat at McEwen Mining. The reason for this goal is to use my profits to fund medical research for regenerative medicine and stem cells. An announcement of a Los AzulesJV would blow the roof off this stock price. 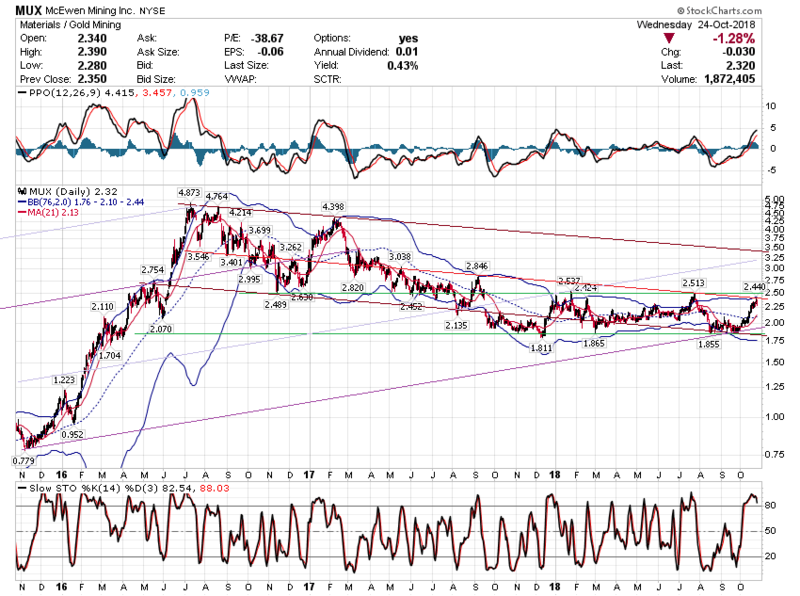 McEwen is carefully building a successor to Goldcorp which he took from 50 mil to 50 Billion. El Gallo 2 , Black Fox , plus GPY and Nighthawk really give MUX explosive potential. Aside from holding share positions in Nighthawk and Golden Predator, what do you think is probable with those companies in the future? I think now McEwen needs a solid established producer merger scenario. The financing of Gold Bar will come first of course and after that I don’t see anymore resource for mine building in foreseeable future. We desperately need monetization of Los Azules. If that happens then I could see these things but then I think Inventus would be next. I know it causes a lot of pain to people to bring up Rubicon but I still wouldn’t be surprised to see that as a possible merger. The gold is there at F2 and someone will get it out of the ground. Current management is making headway in that regard. Long history there for Rob but revisiting that may not be an option. Fully permitted built turnkey facility though. Total conjecture but who knows. Crypto inflows have confounded this space even more than the blatant banksters market manipulation of gold. I have no idea what is next. Gold Bar construction is on track, with the anticipated completion in 2018 and commercial production in 2019. Primary activities during the first quarter have focused on finishing civil works related to the heap leach pad, solution and event ponds, as well as all site infrastructure, in preparation for major equipment and material deliveries in the second quarter. At PDAC in an interview Rob M said we have $11 mil US planned drilling for Timmons area this year. Since completing the purchase of the Black Fox Complex in early October, we are increasing our understanding of the great opportunities to grow existing resources and to make new and exciting mineral discoveries in the Timmins region. We see an opportunity to accelerate our exploration efforts by committing US$10 million in 2018 to conceptual and early stage targets, predominantly on the Black For property. Most investors here have invested primarily in Rob McEwen. They believe he will do what he did in GG. 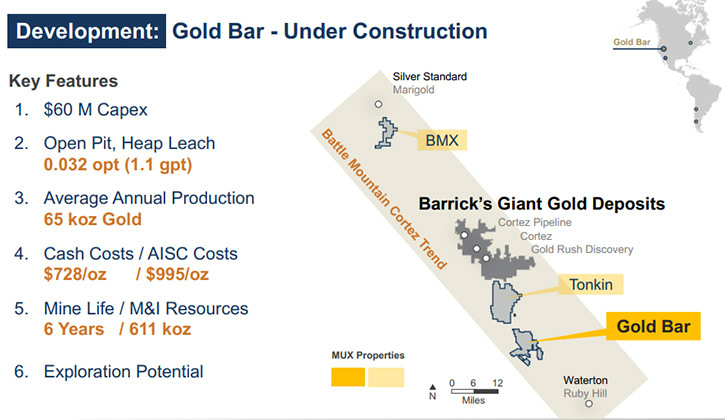 Fundamentally speaking, MUX has expensive mines with relatively high AISC and this has to change. I am talking about Los Azules. Our ceo knows how to put a company under the spotlight. Los Azules is the equivalent of a 40 millions deposit of gold at 1 gr/ton. A joint venture will come before the end of the year to put this sleeping giant under the radar. For the Timmins area and great fox, they will turn this mine around in the next 12 to 18 months. Patience is needed. The fall season could be very exciting. 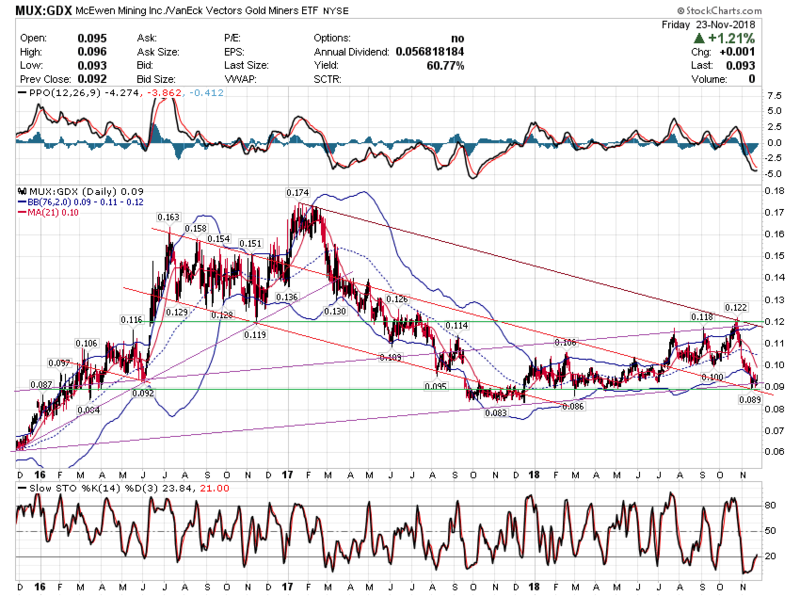 McEwen Mining Inc. (NYSE: MUX) has the goal to qualify for inclusion in the S&P 500 Index by creating a profitable gold and silver producer focused in the Americas. McEwen recently announced the results of a new Preliminary Economic Assessment, evaluating the potential extension of production from its 100% owned El Gallo Complex in Sinaloa, Mexico. The proposed redevelopment plan evaluated in the PEA is called Project Fenix. The key outcomes of Project Fenix include an average annual production rate of 47,000 ounces of gold equivalent, low initial capital cost, mine pay-back of 4 years, and an after-tax IRR of 25% at current gold and silver prices. "Project Fenix shows that El Gallo has the potential to be retooled to produce silver and gold for years into the future. The current heap leach gold mine would transform first to a mill and process the residual heap leach pad material, then additional mill modifications would enable processing of silver and gold ores from four other deposits. This plan depends on innovative in-pit tailings disposal that we think is a win-win for all stakeholders. Over the coming quarters we intend to advance environmental permitting and refine our plans with a feasibility study before making an investment decision next year,"
TORONTO, July 16, 2018 (GLOBE NEWSWIRE) -- McEwen Mining Inc.(NYSE:MUX) (TSX:MUX) reports consolidated production for Q2 2018 of 36,959 gold ounces and 772,432 silver ounces, or 47,258 gold equivalent ounces(1)(“GEOs”), using a 75:1 gold to silver ratio. 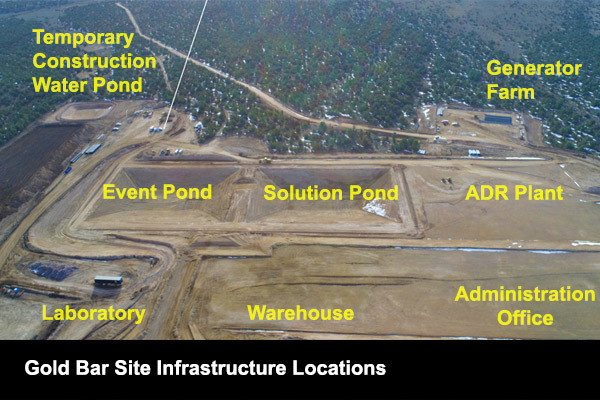 Construction activities at Gold Bar focused on the heap leach pad, and installation of the crushing and process facility. All major equipment and bulk materials are either on site or purchased. Engineering for the project is complete and approximately 90% of contracts are awarded. Construction is advancing on schedule for completion by the end of 2018, targeting production in Q1 2019. During the first three years of operation beginning with 2019, Gold Bar is projected to produce 55,000, 74,000 and 68,000 ounces of gold respectively. Black Fox produced 14,055 GEOs, in line with our full year production guidance for 2018 of 48,000 GEOs. A $15 million exploration program is ongoing across the Black Fox Complex, drilling results and other developments will be released quarterly, with the next update planned in the coming weeks. El Gallo produced 10,808 GEOs, in line with our budget and full year production guidance for 2018 of 32,000 GEOs. By the end of Q2, mining and crushing activities ceased and contractor equipment has been demobilized from the mine site. Closure, reclamation and residual heap leach activities are ongoing and will continue for several years. A new Preliminary Economic Assessment (PEA) study on the potential restart of production from the El Gallo Complex at some point in the future was published on July 9, 2018. The proposed development plan evaluated in the PEA is called Project Fenix. 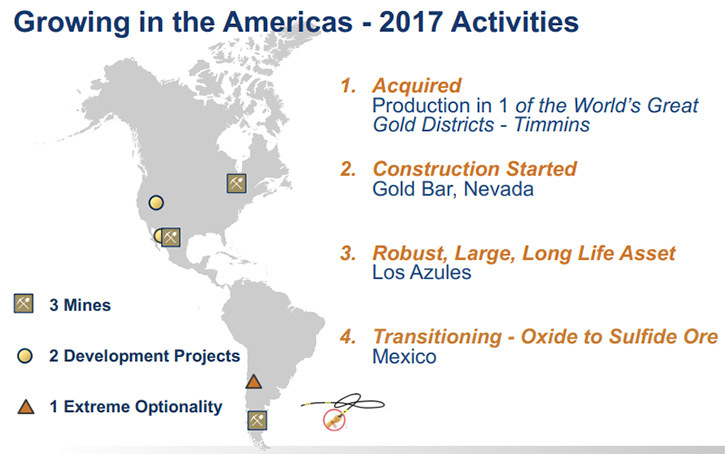 The key outcomes of Project Fenix include an average annual production rate of 47,000 ounces gold equivalent (AuEq), a 12-year mine life, low initial capital cost of $41 million for Phase 1 and $30 million for Phase 2, and pay-back period of 4.1 years. 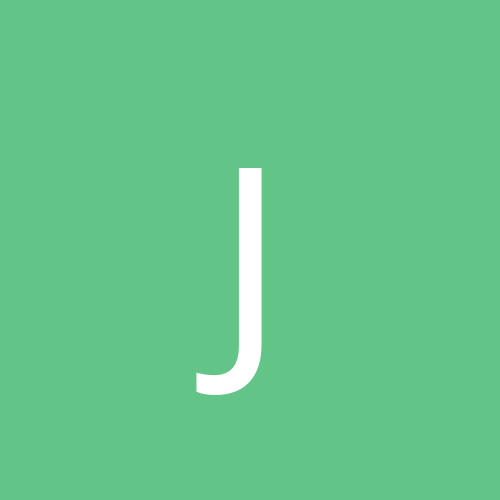 At current gold and silver prices the after-tax internal rate of return (IRR) is 28%, and the net present value (NPV) at a 5% discount rate is $60 million. Capital cost estimates for Project Fenix are to a level of accuracy that is consistent with a PEA technical report. During the next 14 months we will continue to review mineral processing, mine sequencing, material transportation and tailings storage options; and the flow sheet will be optimized by undertaking trade-off studies, updating cost models and additional metallurgical testwork. Our attributable production from San José was 12,139 gold ounces and 769,197 silver ounces, for a total of 22,395 GEOs. Production is on-track to achieve our full year guidance for 2018 of 91,000 GEOs. We received approximately $2.4 million in dividends from our interest in San José during Q2. Operating costs for the quarter ended June 30, 2018 will be released with our 10-Q Quarterly Financial Statements in early August. As of July 9, 2018 we are debt-free with liquid assets of approximately $30 million. McEwen Mining Inc. has released an updated resource estimate for the Froome deposit and highly encouraging exploration results from its continuing $15-million exploration program at the Black Fox complex near Timmins, Ont., Canada. Froome Footwall: Drilling intersected 53.93 g/t gold over 8.29 m including 322.86 g/t gold over 1.34 m , along the footwall structure located approximately 150 m North of the main Froome deposit. Grey Fox: Multiple shallow intersections including 13.41 g/t gold over 2.82 m including 27.70 g/t gold over 0.94 m , and 5.79 g/t gold over 1.99 m including 9.71 g/t gold over 0.93 m from a mineralized cross-structure located in the hanging wall of the 147 Zone, which has a current Indicated resource of 264,000 gold ounces at a grade of 7.49 g/t. I watched the whole thing. 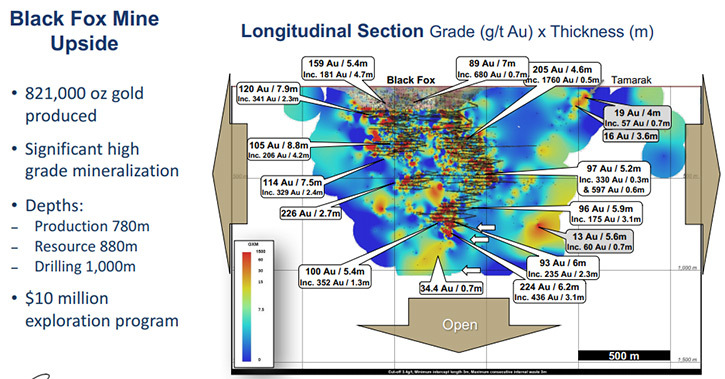 It was highly technical with very impressive gold sample data for Black Fox. Also found the Los Azules copper project presentation quite informative. It's difficult to translate the data into furture earnings as it's very early-stage development. Unless I missed it, there was no mention of the prospectus for the 45 million share issue and I found that very strange - not one question about that in the Q & A. Please join our conference call on Wednesday, Oct. 31st, 2018 at 11 am EDT. 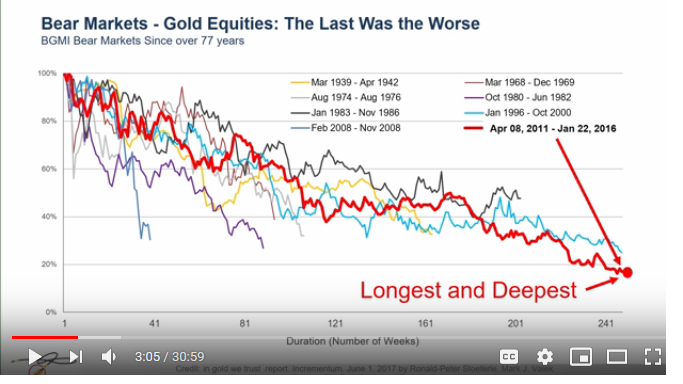 "I believe you have to pay 'Rents' to Shareholders"
"We want to pay a Rent to the shareholders, while we are awaiting a Capital Gain"
Though many may not believe it, with many Gold equities up 100% or more from the Lows"
"We have (at least) a 3X Upside from here." 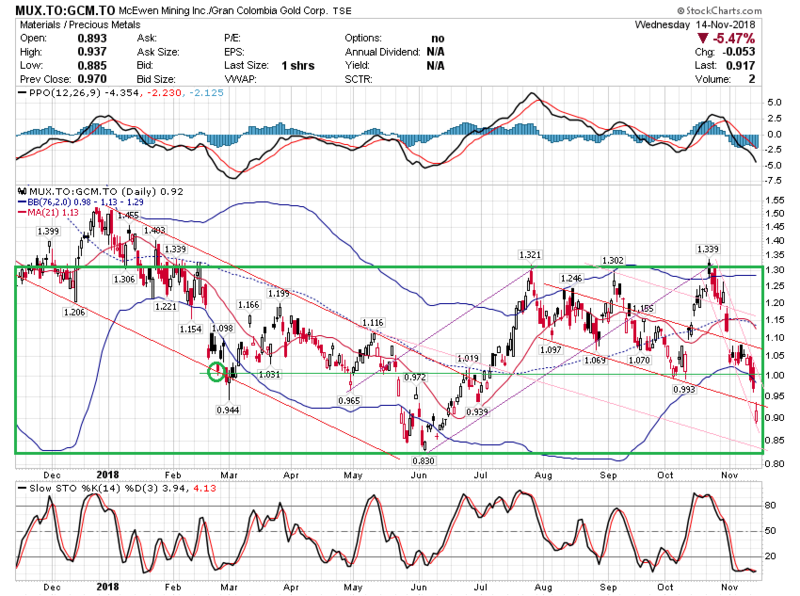 Ratio : MUX -to-GDX - After a Poor month, Down to 9%; Now cheap? "I get $1 a year... we just took on debt for the first time... $53 Million... We have $50 million in cash"
"We are quite liquid. Most of our trading is on the NYSE"
"The Short positions will one day be Fuel-for-the-Fire"
Watching this with interest now it’s back at the lows. Whats knocking this Dr B, why the smack down?